An observation made by an experiment at the Large Hadron Collider involving Florida Institute of Technology physicists Francisco Yumiceva, Marcus Hohlmann and Marc Baarmand has for the first time connected the two heaviest elementary particles of the Standard Model. Using the Compact Muon Solenoid (CMS) detector, which acts as a giant, high-speed camera taking 3-D 'photographs' of particle collisions from all directions up to 40 million times each second, scientists at the CERN-based collider near Geneva, Switzerland, announced findings that reveal how strongly the Higgs boson interacts with the heaviest known elementary particle, the top quark. 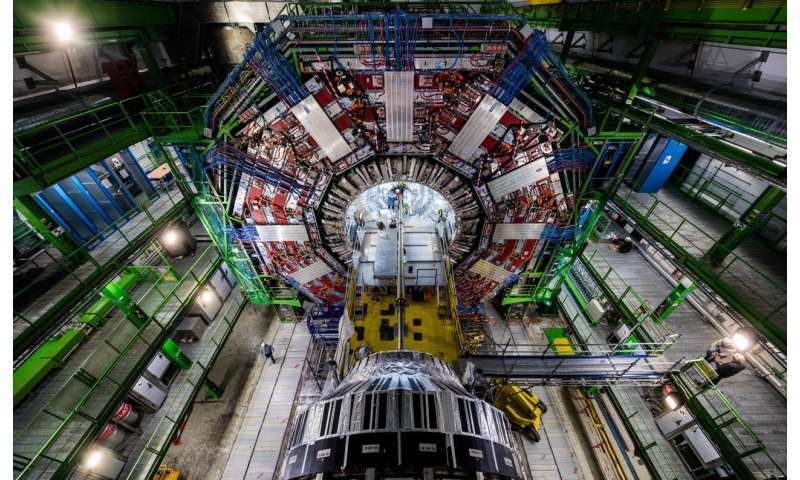 The measurements from the CMS team and another collaboration known as ATLAS indicate the Higgs boson has a critical role in the large value of the top quark mass. While this is certainly a key feature of the Standard Model – the overarching theory in physics that describes the basic components of matter and the forces that govern their interactions – this is the first time it has been verified experimentally with what one spokesman called "overwhelming significance." In the Standard Model, the Higgs boson can couple to particles called fermions. Electrons and protons that make regular atoms are examples of fermions. The heaviest known fermion is the top quark. Generally, scientists can measure the coupling strength of the Higgs boson to fermions by measuring the decay rate of the Higgs boson to other lighter particles. But because the Higgs boson cannot decay into a pair of top quarks, the only way to measure this coupling is to study the production of a Higgs boson in associations with top quarks. "This is the first time these events have been observed in our detector," said Yumiceva, a long-term member of the CMS collaboration. "We have seen the interaction of the Higgs boson with other particles but never with the heaviest particle of all, the top quark." Researchers published their evidence of the Higgs boson-top quark relationship this month in Physical Review Letters. "We were not expecting to have this result so soon," Yumiceva said, adding that the findings were achieved due to the availability of excellent experimental data as well as the use of sophisticated analysis methods that ensure that the required statistical precision could be reached. In addition to Yumiceva, Hohlmann and Baarmand, the Florida Tech team in CMS also includes recent graduate Vallary Bhopatkar, postdoctoral research scientists Stefano Colafranceschi and Daniel Noonan, and numerous undergraduate and graduate students. The group is heavily involved in two major detector upgrades, and several data analyses to measure precisely the properties of the Higgs boson and top quark particles. It was nearly six years ago, on 4 July 2012, when ATLAS and CMS reported independently the discovery of the Higgs boson. The announcement created headlines worldwide: the discovery confirmed the existence of the last missing elementary particle of the Standard Model, half a century after the Higgs boson was predicted theoretically. At the same time, the discovery marked also the beginning of an experimental program to determine the properties of the newly discovered particle.